Review and Giveaway: "A Silent Voice: The Movie"
Two kindred spirits -- a lonely young girl and a solitary young dragon -- find each other and discover the power and magic of friendship. Every day, Rosie waits and watches as children play together, laugh and share stories, hoping she can join in the fun and make a new friend. But every day her wish never comes true. Every day, Rasmus sits in his tree and waits and watches as birds dance in the sky, wishing he could fly just like them. But every day his wish never comes true. Then one day, Rosie and Rasmus meet, and girl and dragon are lonely no more. Serena Geddes’ enchanting tale is sure to make readers believe in the transformative power of love, friendship, and hope. I love beautiful picture books, and Rosie and Rasmus is truly lovely. Geddes' sparse prose and whimsical illustrations not only make this perfect for gift-giving and collecting, but also highlight the beauty of friendship. Like many young people, Rosie doesn't make friends easily. But when she and Rasmus connect through their shared loneliness and feelings of being "different," Rosie gathers the courage to reach out and seek more friends. 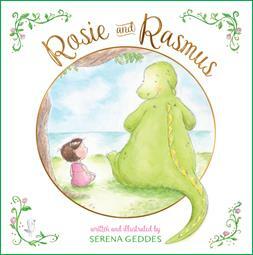 Children will love the little green dragon, Rasmus, and be inspired by their magical friendship. They'll learn about the power of wishing, hope and love. Disclosure: I received a complimentary review copy of this book to facilitate my honest review. This post contains my Amazon affiliate link, and I will receive a small commission on purchases made through my link.